The propaganda unit of Hamas’s “military wing”, the Ezzedine Al-Qassam Brigades, kicked into overdrive recently with a new film, which attempted to portray the terrorist organization’s Gazan fighting force as a modern Islamic army, exhibiting advanced weaponry training for a wide range of scenarios – and with its sights on Jerusalem. The Hamas “army” is seen conducting an array of operations modeled on attacks launched against Israel from Gaza – including several attacks in recent weeks that the terror group has denied responsibility for. 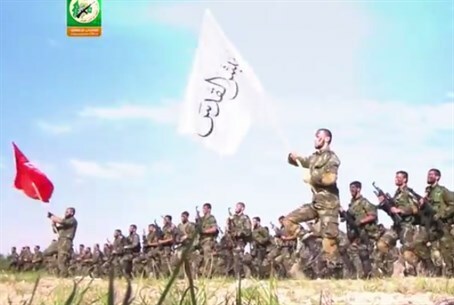 It appears to be an attempt to showcase a recently-announced “popular army”, which the Islamist terror group said it formed following Operation Protective Edge to “liberate Palestine”. In one scene, the terrorists are seen raiding a model IDF post and kidnapping an Israeli soldier. In another, a sniper is seen shooting an IDF soldier; just last Wednesday an IDF soldier was critically wounded by sniper fire during repairs on the security barrier, although Hamas denied it was behind the attack from territory it controls. Tellingly, however, the head of Hamas’s reconnaissance unit was killed by IDF return fire during the incident. Rockets, including the domestically produced M75, are seen being fired on numerous occasions throughout the propaganda film, after just two weeks ago a rocket was fired on Israel from Gaza in a breach of the truce, marking at least the third such case of rocket fire since Operation Protective Edge. In response to the latest rocket attack, the IAF struck Gaza concrete factories used to rebuild the terror tunnels leading into Israel and built to attack Israeli civilians. Over 30 such tunnels were destroyed in the operation, but since it ended Hamas has been busily rebuilding them. Indeed, the propaganda film shows Hamas terrorists in terror tunnels, preparing for new attacks. Likewise naval commandos sporting diver equipment are shown firing from boats, before hopping off into the water and continuing to fire with assault rifles made for maritime usage. Aside from attempts to model itself as a modern, conventional army of sorts, the video is equally a clear attempt to emphasize the group’s jihadi credentials, at a time when other actors – from Islamic Jihad to Al Qaeda and most recently ISIS – have in many ways stolen its thunder. The opening scene includes a commander riding a horse, a common prop utilized by jihadi groups to hark back to the early Islamic armies; equally the white flag of jihad its terrorists are waving – though not identical – bears a resemblance to the classic jihadi flag adapted by groups such as Al Qaeda and ISIS. At the end of the film, the Hamas army is seen crossing a security barrier and approaching Jerusalem with the Dome of the Rock glittering on top of the Temple Mount, clearly advertising the terror group’s aspirations of creating a Palestinian state on the ruins of Israel. Propaganda aside, the much-vaunted “commandos” of Hamas did not fair quite as well during the recent summer war with Israel. Numerous attempts to infiltrate via sea – comprised of terrorists most likely from the same “naval unit” as the one shown in the video – failed miserably, with the terrorists cut down by IDF fire almost immediately upon landing ashore. Indeed much of the propaganda surrounding Hamas’s “new” army is unlikely to be much more than that – an attempt to rebuild its image after a largely futile war with Israel which saw it, and the territory it controls, ravaged by fighting with little to show for it. But Israeli intelligence officials will be studying such videos carefully, and those politicians and military leaders who pushed for a more decisive victory during Operation Protective Edge will likely view such a show of force as vindication of their position.